60 Days To Go…And Full Of G.A.S. A few days ago my countdown app chirped sixty days to go. I can’t believe it’s been 40 days since my first blog post on Appalachian Trials! In that time, I have backpacked 60 miles on the weekends, bought two tents (and sold one), bought 2 backpacks (and sold 2 backpacks), and began to fine tune my trail food. My gear list is just about dialed in for my 6 day shakedown hike next week. You could say I’m suffering from a little…G.A.S. G.A.S., as in Gear Acquisition Syndrome. There’s no antacid for this kind and it’s real. All of us making this hike have some level of it. For me, researching gear and talking about gear is part of the fun. It’s a great way to pass the time in between trips to the woods. Then, it’s fun to take the new gear out and see how it performs. 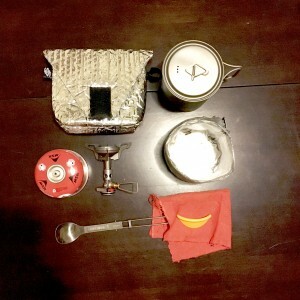 My cook kit. It’s pretty much the only thing that hasn’t changed. Finding gear that fits can get particularly difficult for me because of my size. I’m 6’2″ with broad shoulders and a little bacon on my sides. This means I shop in the big and tall section, and in the world of backpacking, manufacturers design gear for the petite 5’9″ athlete. I get some reprieve with the small American made companies, which in the community are known as “cottage gear companies.” These companies are on the front lines of creating ultralight backpacking gear. The best part about buying from the cottage companies? You’re buying made in the U.S.A. and the customer service is usually 5 star. Just about everything I’m taking is American made. Woohoo for the red, white, and blue! 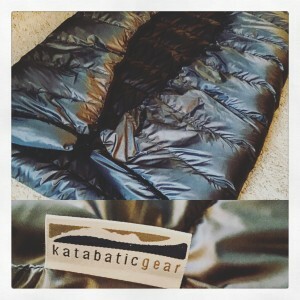 Katabatic Gear Flex 30 Quilt. Made in the USA. It’s like bringing your favorite down comforter into the woods. I tend to get very obsessive over my kit. I mean, I once spent an entire Saturday (like literally, the entire 24 hours of it) researching the best cell phone case for a thru hike (hint: it’s not a Lifeproof). How about my method of documenting my hike with video? Months of research. Which portable power bank? I’m growing gray hairs just thinking about it. I am what is affectionately called a “gram weenie”, which means I obsess over every gram of weight that goes into my backpack. That doesn’t mean I’m a super ultralight backpacker, but rather one who is conscious of every thing in my pack and more importantly, ensuring every ounce counts. I find it fun. Other’s may not. My favorite part of collecting gear is discovering the small cottage companies who decided to give the corporate world the middle finger and do it their way. And when it comes to my hike, I’m going to do it my way as well…minus the middle finger. That would be rude. Haunted by a failed thru hike attempt in 2016, I am back in 2017. My head is clear, the flame is reignited, and I am hungry for the trail. It seems we’re headed out about the same time and I’m also having G.A.S. I’m still subbing out heavier things for lighter things every day. Thanks for the diagnosis, I think I have the same thing!! What brand of insulated bag are you using? I see it in the picture of your kitchen gear. Congratulations and good luck! I’m just down the road from you in Lancaster. You may want to check out Hammock Gear. Very happy with equipment I have from them.Saved about 2lbs switching from sleeping bag to their Burrow 40. As you may guess from email address, I am going in another 7years. Plenty of time to obsess! Talk about hard to find gear. I am currently wearing a size 15 shoe but really should be wearing a 16 or 16 1/2. If my feet were not so tender I’d consider going bare foot. My other gear, I have been obsessing about what to take or not take for a spell. I finally decided to take what I have and change to something else when the opportunity and need arise while I am hiking. Nine more days and I am leaving West Virginia for Amicalola Falls SP. Good luck to you and everyone else who decides to get out there!